Any setting not listed below should not be changed from its default state within the private match lobby. The global settings are to be used for all game modes unless otherwise specified in the game modes specific section. The hosting team is responsible for setting up a private lobby match with the correct settings and the correct map. If the hosting team starts the game with the wrong settings, it will result in penalties for that map. Please refer to the Penalties section of this rules page. Each team is only allowed one iteration of any character on the team at one time irrespective of character skin. For example, “Vintage Kait” is the same as “Armored Kait”. A single COG team is only allowed 2 female characters. Color Blast character are banned in all competitive play. A single team may only use one Day of the Dead Character and/or one Spectre Character Skin. A single COG team is only allowed one Zombie character. If a Zombie character is used, a non-Zombie iteration of that character may not be used as well. Ex: Zombie Dom and Commando Dom cannot be used at the same time. A full list of character iterations can be found here. Default Start Time: All first round matches will have the same default start time. After round one, all matches have a unique default start time that is dependent upon the time at which the teams’ previous round results were submitted. Matches must be started by their default start time and played until completion. Postponing matches is only at the discretion of online tournament staff. Double Forfeit: If a match is not played, and neither team submits a ticket requesting the forfeit win, both teams otherwise forfeit the game/match, and the game/match win will be awarded to the higher seeded team. Seeding: Teams will be seeded by pro points. Seeds are done in ascending order. Seed one is the highest seed. Definition: The host is the player who must create the custom game and ensure that the proper settings and map are used. 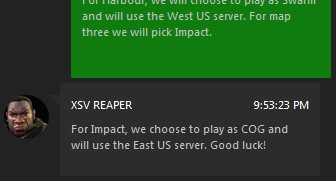 The team that picks Dedicated Server Location will Host the match. 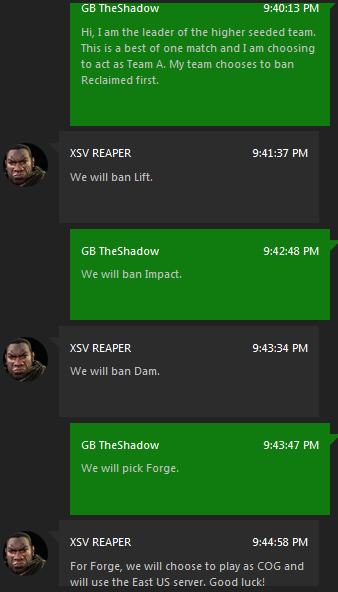 Ban/Picks over XBL Messaging: Teams must conduct the pick/ban process over the XBL messaging system. Screenshot proof of the pick/ban process will be required for resolving disputes concerning the picks and bans. If players dispute the match results claiming that the wrong map was hosted but fail to provide proof of the picks and bans then the played map will be accepted as the official results. In the event that teams do not have proof of the pick/ban process, a tournament staff member will determine how the match will proceed. Map Bans, Host, and Side Choice for each Game: In all scenarios the Higher Seeded Team will choose to act as Team A or Team B during the Map Ban process. 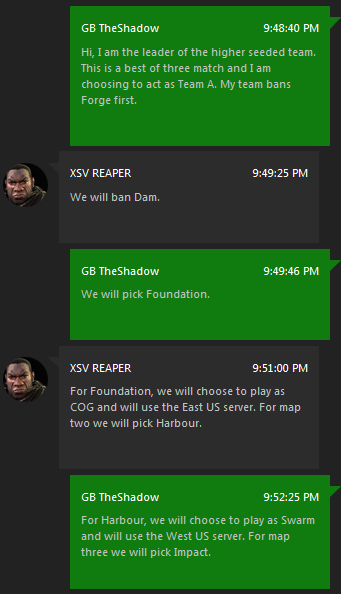 The team that picks faction will host the match. Neutral Hosting: No outside person or third party may host the private lobby, nor will any spectators be permitted. This rule is at the discretion of MLG staff. MLG staff reserves the right to host and/or broadcast any match at any time. Procedure: Hosting players should create the custom game. As the hosting team changes over the course of a match, the new hosting player should leave the custom game and create a new one. A lag test should be performed before the start of each game to ensure all players have an acceptable connection. Finish Games: If a player’s connection to the server becomes unreasonable during a game, the game must still be played. The lag incident should be reported to tournament support immediately following that game. Match Length: All matches will be best of one (1) until semi finals. Semi finals and finals will be played as a best of three (3). Delays: Teams may not delay the start of a match beyond its scheduled start time, without the approval of a tournament official. Teams may delay a match between games for up to five minutes. Teams can request that a tournament official enforce this five-minute time limit. After five minutes of a tournament official enforced delay, if the delaying team does not have the minimum required players, they will forfeit the match. Minimum Required Players: Teams may only be short handed by one player in order to start an Escalation game. A team will forfeit the match if they are missing more than one player than the match specifies by 15 minutes after a match’s default start time (grace period). Teams will be forced to start a game at the end of a grace period. Disconnections: In the event that a player disconnects the current map will remain in progress until it's completion. The disconnected player may be invited back. Neither the hosting team nor the non-hosting team may leave the match, leaving the match may result in a forfeit of the map. Hosting Disagreements: If the non-hosting team does not agree with the map or server selection, they must leave the game within the first thirty seconds and contact tournament live support about the issue. Normal Boundaries: Players who move their character outside of the normal boundaries of a map may forfeit the game. Moving outside of the normal boundaries of a map includes, but is not limited to, part of the character’s body passing through what should be a non-permeable surface or object, and moving into any area from which your character registers shots on an opponent who is not able to register shots on your character. Cross Compatibility: All players must be using an Xbox one console to compete in this tournament. Playing on a PC will result in a forfeit of the map. Outside Players/Spectators: After a custom game has been created, only eligible players on the two teams, and staff members, may be invited/join. If an ineligible player joins a game, the game must be ended if the player affects the game and/or doesn't leave within 30 seconds of joining. If a player is found to have invited an ineligible player to a game, they will forfeit the game. Sliding: Weapon sliding and wall bouncing are permitted in this competition. No Shows: The no show grace period time is 15 minutes after the match's original start time. For example, if a match is scheduled for 10:00 PM, the no show time for this match would be 10:15 PM. No shows must be verified by a tournament official. In order to contact a tournament official use Live Support. If a tournament official isn’t immediately available, a ticket must be submitted within 30 minutes of the scheduled match time. The ticket must include proof that their opponent did not show. Select "I'm reporting: my opponent did not show" under “Report Problem” on the match page. Time Limit: Both teams must report the match results within 10 minutes of its completion. Failure to report the match results on time may result in a forfeit. Report Match Score: To report the match results, teams must report the match score accurately, with overall games won being reported. For example, the match score can be reported as 2-0, 2-1, 3-0, 3-1, or 3-2 depending upon the match length. Reporting the individual points for each game is optional. Screenshots: At least one member of each team should take a screenshot(s) of each game’s results in case proof is needed for a dispute. Screenshots should be clearly visible and contain the game score, all players on both teams, and a time stamp. Dispute Evidence: If a screenshot(s) is needed in order to resolve a dispute, it should be transferred to the user’s computer and uploaded to an image hosting website such as Imgur. Videos may also be uploaded to a website such as YouTube. The URL for the image(s)/video must be attached to the dispute ticket(s) or provided to a tournament official via Live Support. The issue must be clearly stated as well as the time in the video in which the issue occurred, and/or what the tournament official should be looking for in the picture. Live Support Limit: Only 1 player per team should use Live Support for in-game issues and that player should stay on Live Support until a tournament official answers their call. Abuse: Verbal and/or written abuse of a tournament official will not be tolerated through any medium. This includes, but is not limited to, voice communications in game, voice messages, live support chats, and written messages on GameBattles, Twitter, Facebook, etc. Violators of this rule may be disqualified from the tournament. Settings: The hosting team will forfeit the game if the incorrect setting(s) affected the game. Hosting a map not agreed upon during the pick/ban process is considered an incorrect setting. Characters: Use of any restricted item/character will result in a forfeit of the game that the items/characters were used in if it affected gameplay. Premature Game Ending: Teams that force the game to end prematurely by player(s) switching teams, leaving the game, inviting outsite players, and/or the host ending the game may result in the loss of the game. Equipment: Players may not use a Turbo Controller, a Button Macro controller or Keyboard/Mouse. Turbo Controllers allow players to press a button that results in their character performing a set of actions that would normally require the player to press the same button multiple times. Button Macro controllers allow players to press a button that results in their character performing a set of actions that would normally require the player to press multiple buttons. The team using the ineligible equipment will forfeit the games of the match it was used on. IP Flooding (DDoS Attacks): Performing or assisting with a DDoS attack of your opponent will result in immediate disqualification for that team. All players on that team will be suspended from GameBattles for up to seven hundred and thirty (730) days. Account Recovering XBL Accounts: Tournament participants are forbidden to allow others to play in this competition in place of them by sharing XBL accounts. The offending the team forfeits the entire match. The offending players will be suspended from the site for up to thirty (30) days. *These rules only apply to broadcast matches and override any other conflicting rules. Broadcasting Permissions: MLG reserves the right to broadcast any match. If MLG chooses to broadcast a match, MLG Staff members must be allowed into each game. Broadcasted Finals: Tournament finalists may be requested to make themselves available the following Wednesday after the tournament, as finals may be scheduled for and broadcasted on that day. Match Scheduling: Players are required to be online and ready to play 30 minutes before their scheduled broadcast match. Scheduled matches may be moved back if previous broadcast matches are running behind schedule but players should still be ready to play 30 minutes before their original scheduled match start time. Player Communication: All players involved with broadcast matches will be directed to join a Discord channel. All match communication between staff members and players should happen in the assigned discord channel. Eligibility: AX , AL , AD , AM , AT , BE , BA , BG , HR , CY , CZ , DK , EE , FO , FI , FR , DE , GR , GL , HU , IS , IM , IT , LV , LI , LT , LU , MK , MT , MD , MC , ME , NL , NO , PL , PT , IE , RO , RU , SM , RS , SK , SI , ES , SE , CH , TR , UA , GB , VA residents only. Players must be both a resident of and physically in the region they are competing in. Employees of MLG, the tournament's participating sponsors and their advertising agencies, and members of the immediate family of any such persons, are not eligible to participate and win. For the complete list of restrictions/limitations, please visit the prize tab. Any team found using a restricted player may be disqualified from the tournament. Team Management: If leadership of a tournament team is transferred to another member of that team, that person gives up all team editing privileges (adding/removing players, disbanding team, ect.). This includes any player/team "credit sponsors". As a warning, credits will not be refunded for any players the "credit sponsor" pays for if he/she is removed from the roster after leadership is transferred. Valid Gamertags: All gamertags on a team’s roster must be valid. Each user on the roster must legitimately own their Gamertag. A Gamertag’s spelling and spaces must be exact, but the correct case is not necessary. Gamertags may not contain foul language, disparaging remarks, hateful or racist names. Any changes to a team roster after the tournament has been seeded is at the discretion of tournament staff. This includes changes to Xbox Live Gamertags. Players may only be added to a roster (username and gamertag) up until the end of that team's first match. Gamertags must be linked to a player's GB/MLG Account before the start of the tournament bracket play. Privacy & Impersonation: Individuals are prohibited from sharing account information stored on GameBattles with another person for any reason. This includes, but is not limited to, the following: usernames, passwords, Gamertags, email accounts, etc. Individuals may not use another player’s XBL Account in a game. Individuals may not allow another player to use their XBL Account in a game. Players who break this rule may be disqualified from the tournament. In game IP checks will be administered at the discretion of the Online Tournament staff. This will ensure no one is account recovering and attempting to play on another person's account. However, IP checks will not be done after the match has been completed. Check In: Teams must use the Check In system on the day of the Tournament in order to acknowledge that they are ready to play in the Tournament. Teams that do not go through the Check In procedure will not be eligible for the Tournament and will not be placed into the Bracket. Anyone on a Team can check the whole Team in. For a detailed explanation on how to check in, Please review this support article. Rescheduling: In the event that this tournament cannot be completed within a reasonable amount of time or due to technical problems, all unfinished matches will resume the following day at a time approved by Administration. In this event, your team will be notified of the new time by a staff member via Xbox Live & GameBattles Private Message.